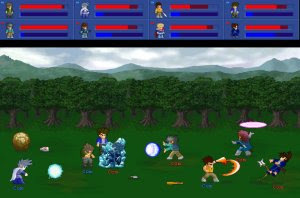 Little Fighter 2 (LF2) is a popular freeware fighting game for Windows. LF2 was created by Marti Wong and Starsky Wong in 1999. Its popularity has been substantial thanks to its simple yet addictive gameplay, its great replay ability and free at the point of use availability. The game can have up to 4 human players on one computer and 8 characters in network play at one time. Game modes include VS mode, Stage mode (where 1 or more players move through the environment killing increasing numbers and difficulties of enemies), Championship mode and Battle mode (involving mass armies led by a player).